Your dog or cat will think of us as their home away from home in our luxury pet boarding suites! Keep your pup looking their best with full grooming and bathing services. Give your dog somewhere fun to go during the day while you’re at work! Send your pup to their favorite home away from home! 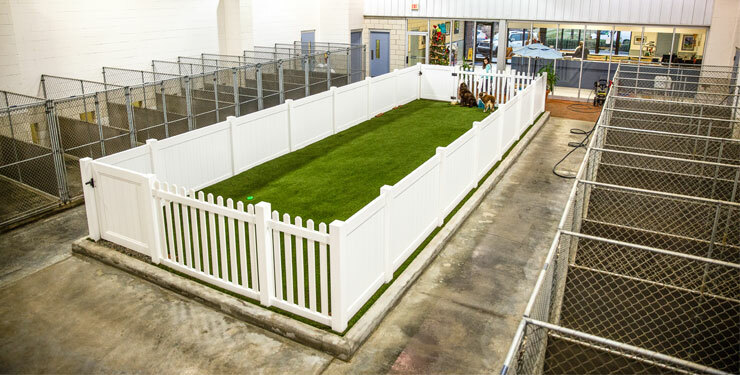 While you’re away, you can rest easy knowing your dog is enjoying a safe environment and personalized attention. Whether your pup is staying in one of our standard runs or living it up in a luxury suite, Carolina Pet Place is your dog’s own personal vacation spot! Be sure to check out our a la carte menu for add-ons! Includes one walk, snack time, and one playtime a day. Customize your pet’s stay with personalized services! Yes, we board cats! Your cat will love our clean and comfortable cat boarding area and you can enjoy your time away knowing your pet is safe and happy. 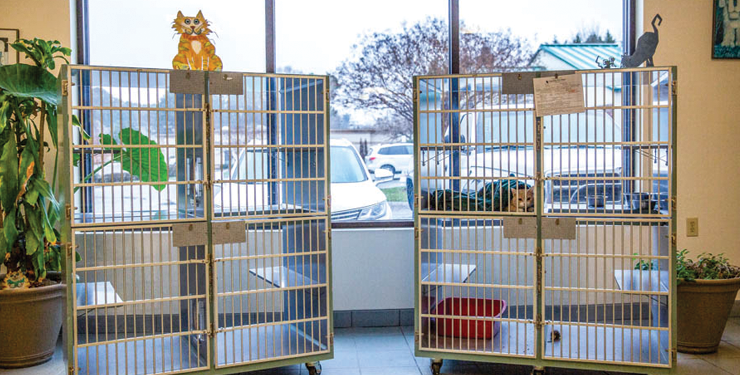 Our luxurious cattery is equipped with condos of various sizes and features an indoor cat tree, oriental rug, and large windows overlooking our reception area and outside. The entire area is climate controlled to keep your cat cozy in the winter and comfortably cool in the summer. Cats are fed and watered twice per day with Hill’s Science Diet cat food. Keep your pet looking and feeling their best with professional dog grooming services at Carolina Pet Place. Grooming is about more than looks—for some breeds, regular grooming is essential to keeping your pet comfortable and healthy. Schedule an appointment today! 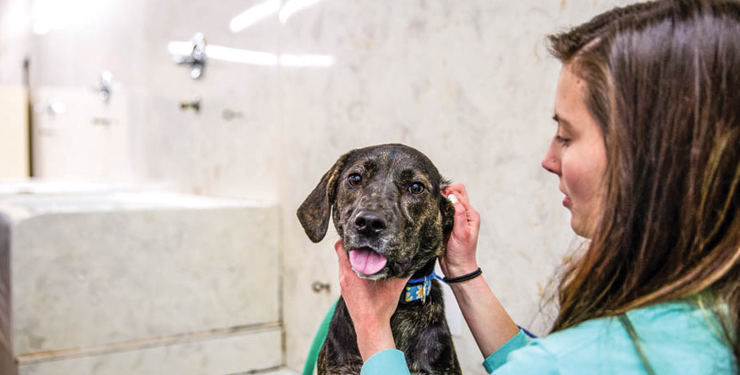 Grooming requires an appointment, but walk-ins are welcome for our dog bathing services! Bathing walk-ins may be dropped off before 10:00 am Monday through Friday. You may also request to have your dog bathed prior to pick-up if they’re staying with us. By appointment only. Includes bath, nail trim, and haircut. Prices start at $50 and vary depending on breed, condition of coat, and the size of your dog. Walk-ins welcome! Baths include ear cleaning, nail trim, brushing, and bathing. Prices start at $30 and vary depending on breed, condition of coat, and the size of your dog. Busy schedules can be hard on your pup, especially if they’re home alone all day. Make every day something new and exciting for your dog with doggie daycare! 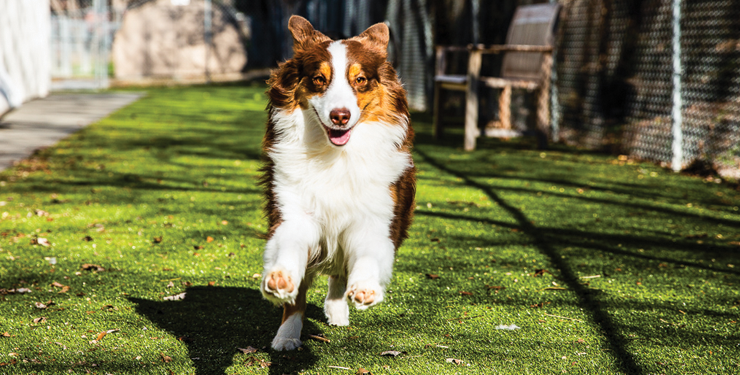 Our daycare service offers a place for your dog to have fun and get some exercise in a safe environment, whether you’re at work or just dealing with an extra busy day. No need to make a reservation! You will be required to sign a release for group play activity and to bring your dog in to pass a Pet Assessment Test so we know your dog can safely play with others. We can’t wait for your pet to stay with us! Note: Please see our policies for vaccines and other requirements before booking.